I ended up staying home with 2 sick kids today so I stole some time to make some Lotto Blocks. I managed to make 7. It took me about an hour and 20 minutes. Now I have to go spend at least that amount of time on cleaning house. 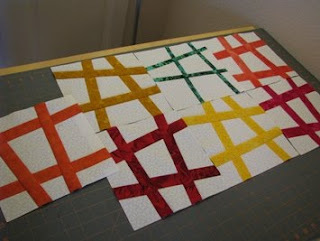 I also made some tic tac toe blocks, a few days ago, for a baby quilt. I can’t wait to see what the winner’s quilt will look like! Huh? They only took 1 1/2 hrs? Mine took nearly all day(not counting the fabric printing & test washing). 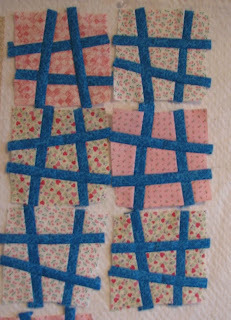 I'm obviously rubbish at this patchwork block thing… Did you already have the strips cut out or are you just superwoman? Andra, Welcome to the block lotto!! Your blocks look great … and I really like the look of the blocks for the baby quilt. What cute blocks and nice color ways, especially the little baby blocks. Those baby blocks are sooo cute. What a lucky baby, that'll recieve your quilt. Did I say cute?!! I also love the baby quilt blocks! Please post it again when it's finished, ok?